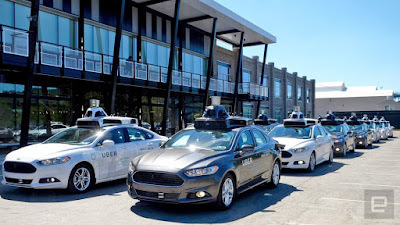 JT IRREGULARS: "Uber is working on tools to fight motion sickness in self-driving cars"
"Uber is working on tools to fight motion sickness in self-driving cars"
Light, rushing air and vibrating seats might keep you well. "Motion sickness is a real problem in self-driving cars. As you're not in control of where the car is going, you might feel queasy when the vehicle moves in ways you weren't anticipating. Uber clearly needs to minimize that urge to hurl if it's going to create an autonomous fleet -- and accordingly, it's exploring technology that could make you feel at ease. It's applying for a patent on a raft of technologies that would counter motion sickness by stimulating your senses as the car moves, distracting your brain. "Light bars and screens could signal the car's intentions, giving your mind a chance to prepare for that upcoming turn. Alternately, your seat could twist in response to turns, or vibrate during braking. It could even blast you with air at varying directions and speeds to provide continuous stimulation that takes your attention away from the car's pitching and bobbing. "This is just a patent application, and there's no guarantee that any of it will be implemented in future robotic cars. The Guardian notes that some techniques work more effectively than others: air may be a viable option, while a vibrating seat might not do much at all. With that said, Uber has a strong incentive to implement some kind of anti-sickness measure. Even if only a fraction of customers toss their cookies, that could represent a lot of lost business -- whatever Uber pays to keep your stomach settled could easily pay for itself through more rides." I wonder if self-driving cars do better than some of the idiots I've seen out there. Self-driving cars don't shave while they're driving. They don't read books or newspapers. They don't text. They just concentrate on driving. And still they get into accidents. with a name like uber, who would want to use them?